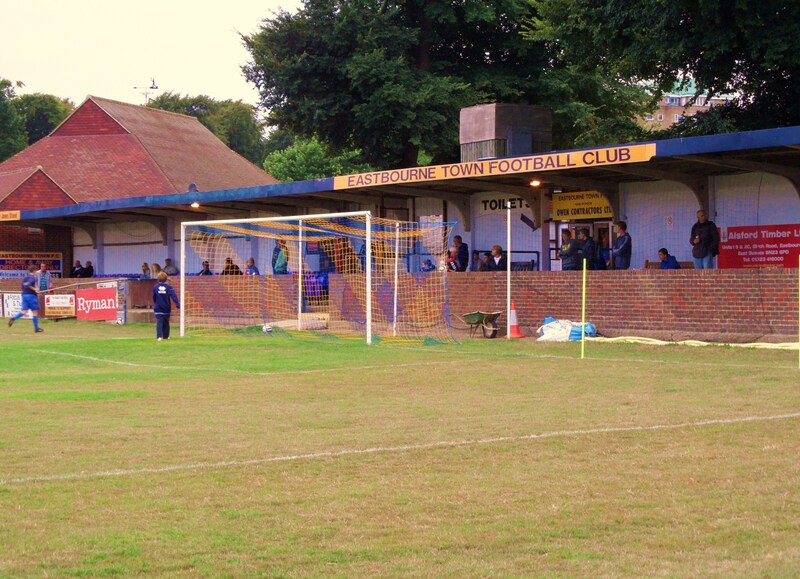 About The Saffrons The Saffrons has been home to Eastbourne Town FC since 1886, and despite its fantastic location and outlook, has undergone considerable improvements in recent years. It can now justifiably claim to be one of the most charming grounds in the County and is well worth a visit, being easily accessible by rail. However, it wasn’t always this way, particularly after the 1987 October Hurricane, during which the ground lost the roof from the stand behind the far goal. In 1994 the roof was replaced along with other restorative work, and new stand was renamed in memory Club stalwart Sid Myall and former manager/coach Taffy Jones. 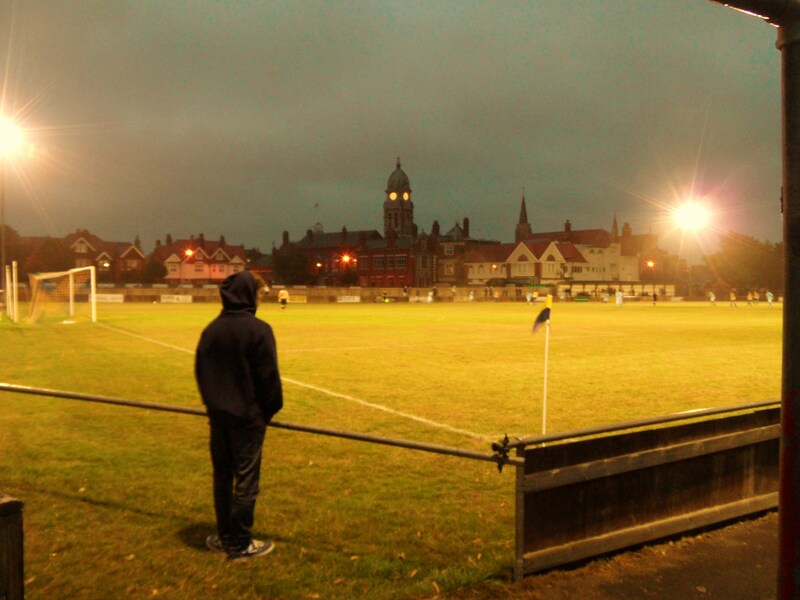 Floodlights were also added in the late 1990s. 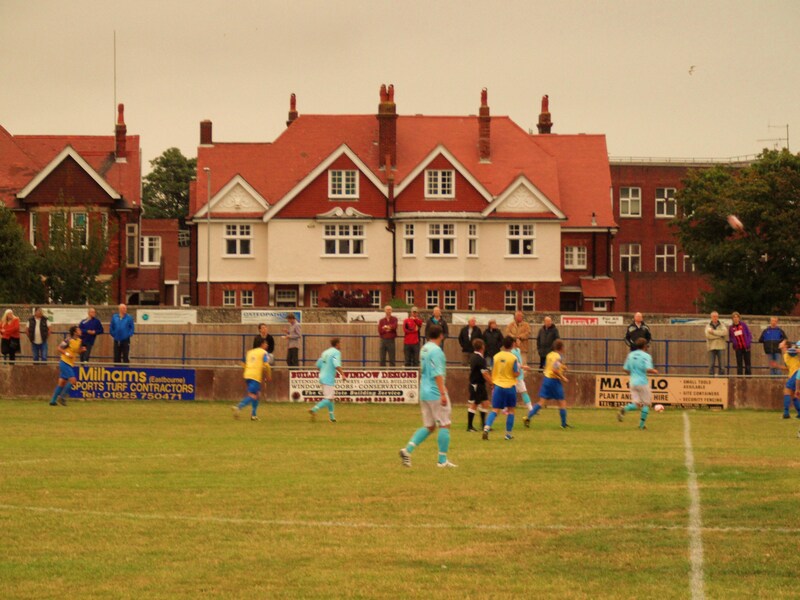 A tea bar, new dressing rooms and a Clubhouse have since been added behind the stand. Fixed covered seating is available in the main stand, behind one of the goals. At the opposite (near) end of the ground a new terrace has been constructed, and during the football season a movable fence is now in place along the far touchline to enclose what was previously a three-sided ground (cricket is played at the Saffrons during the summer months). At the end of June 2006 the Club announced a £21,000 Football Stadia grant that will be used towards the installation of 150 new seats in the main stand as well as other improvements that include the renewing of turnstiles and emergency lighting, as the Club continues its quest for promotion further up the Non League Pyramid. The current capacity is 3,000 with space for about 200 in the main stand. The club has use of the cricket pavillion bar next door which is roomy and very comfortable. The food bar is also quite unique – like walking into someone’s front room with a settee to sit and wait. It also allows you a view of the action outside. Many thanks to the club for providing the above information. How to get to The Saffrons By car – follow the A22 from London towards the city centre. When you get to the roundabout with the A27 eastbound carry straight on onto the A2270 Polegate by-pass. Continue on this road as it becomes the Upperton Road and then once you reach the small roundabout at the station take the second exit (right) along Grove Road. At the end of Grove Road – turn right and proceed along Meads Road – the Saffrons is on your right. Take the second exit into Compton Park Road and the entrance to the Saffrons is on your right. Car parking is available at the Saffrons next to the cricket pitch and also in surrounding streets a few moments walk to the ground. By train – The ground is a five minute walk from Eastbourne station. Come out of main exit and cross road straight ahead. Take right into Old Orchard Road (to the left of The Banana Tree) and continue down this road. At the end of this road the ground is opposite you. There are plenty of bars and cafes within a 5 minute walk of the ground. Getting into The Saffrons With an average crowd of a couple of hundred there is never issue in paying on the gate. Admission for 2010/11 season is £7 for adults, £3 for seniors and £1 for under 16’s. Our last visit – August 2010 One year ago to the day EFW’s Danny Last rang me up. “Stu” he said “I’ve got a plan. Let’s sponsor a couple of players, make it into a competition and have some fun.” Never one to turn down a challenge nor missing an opportunity to put something back into the grass roots of the game, we came up with the EFW/TBIR Challenge and picked two players at Lewes who we would both sponsor, and like a real life fantasy football, would award them points for their contributions. You can read about the rules here. As we know the season was a tough one for Lewes and both Sam Crabb and Ryan Storrie found themselves squeezed out of the first team and both deciding to seek their chances elsewhere. So we put the cup back in the trophy cabinet, and the champagne on ice, trying to work out a way to award it to the winner. One year on and Lewes are completing their pre-season fixtures with a game down the road at Eastbourne. Now Eastbourne Borough have traditionally been their local rivals and three seasons ago they both rose from the Blue Square South to play in the Blue Square Premier for the first time. Whilst Eastbourne managed to hang onto their position, Lewes were relegated. Bt Lewes weren’t in town to play Borough (they had actually lost 3-1 a few days before to them) but to play Eastbourne Town. And what would you guess, lining up for Town would be Ryan Storrie and Sam Crabb – a perfect opportunity to complete some unfinished business. Eastbourne actually supports a third team too, with Eastbourne United (once coached by the legendary Ron Greenwood) playing in the Sussex League giving the town a strangely three way rivalry. However, Eastbourne is known as “Gods Waiting Room” for a reason and so passions do not really run high when the football season starts. Town are actually the oldest of the three teams, but had only played at the county level for more than seventy years before they finally made the Isthmian league in 2007. Since then they have struggled and last season’s 22nd place finish would have been enough to have relegated them back to the Sussex League if it wasn’t for the various teams failing to meet the league’s criteria. But this season confidence was high with a few new players such as Sam joining the team. So back to the whole EFW/TBIR Cup competition. Lolly was keen to see Ryan again. After we did the sponsorship deal for him last season she went back to school and told her classmates that “Daddy bought a footballer during the summer” and genuinely bigged him up. He in turn gave her his shirt from the previous season that fitted her like a glove….Lolly is of course 10, so you may get the impression that Ryan isn’t that tall. But he does pack a punch down the wing and so we expected him to rise to the challenge, especially with our chosen player this season, David Wheeler still not available after his Summer’s charity work in Africa. With Danny at work interviewing Oliver Kay from the Times, and Big Deaks tempted by a leaving do it was up to Cynical Dave and myself to provide the lunatic fringe element for the team. Eastbourne Town 1 Lewes 0 – The Saffrons – Friday 6th August A week after watching a game in a constant drizzle and thinking “this is summer”, we arrived in Eastbourne just as a similar constant drizzle descended on the town. The Saffrons is certainly unique – a park like setting sandwiched between a cricket ground and a bowls green a stones throw away from the town centre. The main stand is unusually behind the goal, and it has one of the most unique food bars in the game which is basically a converted conservatory complete with comfy chairs to wait for your order. The crowd was no more than a hundred or so and most took refuge in the main stand to watch Eastbourne tear into a Lewes team containing some experienced players. Notably Storrie and Crabb played well in the first half, combining to create a couple of chances. Having joked with Ryan Storrie in the days leading up to the game that I had never seen him score he told me to put a bet on him to get the first goal here, and he certainly looked up for it. Lewes on the other hand seemed comfortable in midfield, although there was an over tendency to keep playing the ball along the back four which served little purpose. Half time was a welcome relief and a trip next door to the cricket bar was needed, although with darts, pool and Norwich City v Watford on the TV it was tempting to stay in the warm and dry. But I am now a loyal Lewes fan so I have to take the rough with the smooth, and the frequent rain with the sunshine so we went back outside. The good news was that Eastbourne had taken off Storrie, who did seem to be a thorn to Barness. However, the home time continued to try and beat the Lewes offside trap and it was inevitable that if there was to be a goal it would be through a marginal offside decision and that is exactly what happened when a simple ball through the middle was not flagged and the Eastbourne forward just beat Winterton to the ball to push it into the net. Lewes’s best chance came with five minutes left when they were awarded a penalty. Sure it was a foul on the Lewes player but from our decent position it appeared outside the box. Referee looked at linesman, linesman looked at referee, sort of shrugged his shoulders and put his flag across his chest unconvincingly. Gradwell stepped up but saw his penalty tipped onto the post by the Eastbourne keeper, which I think from memory was the only shot on goal they had had all night. Not a good night for Gradwell as he had started from the bench after turning up late. Farnborough Town, and ex-Lewes manager Steve King was in the crowd. Hard to see what would have worried him about Lewes’s play, although perhaps he was looking at the likes of Storrie and Crabb who could both still do a job in the Blue Square South. But at the end of the day only a fool takes bragging rights from a friendly, says he wearing the latest Gold and Sullivan merchandise – the 5 out of 5 T-shirt celebrating our pre-season wins versus Peterborough, Milton Keynes Dons, Borussia Monchengladbach, Ipswich and err someone I cannot remember. The real test starts in 7 days with Staines away. Come on you Rooks! More photos from the evening can be found here.